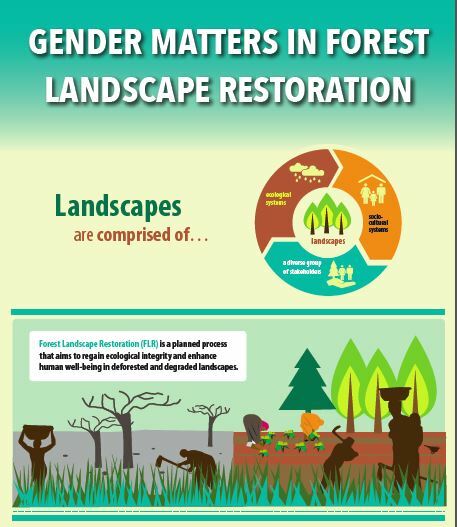 The essence of gender-responsive Forest Landscape Restoration (FLR) is ensuring that women and men at all levels have equal voice and influence in strategic decisions related to FLR, and that this contributes to substantive equality in outcomes for women and men. Free and Prior Informed Consent, fair and just compensation, and impartial and effective grievance mechanisms for all those affected are critical to safeguarding the rights of local andindigenous women and men. Decisions about target areas for restoration, choice of stakeholders for FLR governance and how to include them, restoration approaches, priority species and how to monitor progress should be made following gender-inclusive participatory processes to capitalize on the knowledge and experiences of both women and men. Mechanisms and measures at various scales are required to equitably distribute benefits and costs associated with restoration for both women and men in participating communities.